Studies have shown that social support is an important prognostic predictor in older people who have suffered an acute myocardial infarction (AMI). Patients with low perceived social support have worse outcomes after their AMI, including higher mortality, more cardiac events, and lower quality of life (QOL). However, most studies have focused on older men, and few analyses have looked at the role of social support in younger AMI patients, especially women. In a study published in the Journal of the American Heart Association, Bucholz and colleagues used data from the Variation in Recovery: Role of Gender on Outcomes of Young AMI Patients (VIRGO) study to examine social support in younger patients after they had an AMI, particularly women, from the United States and Spain. 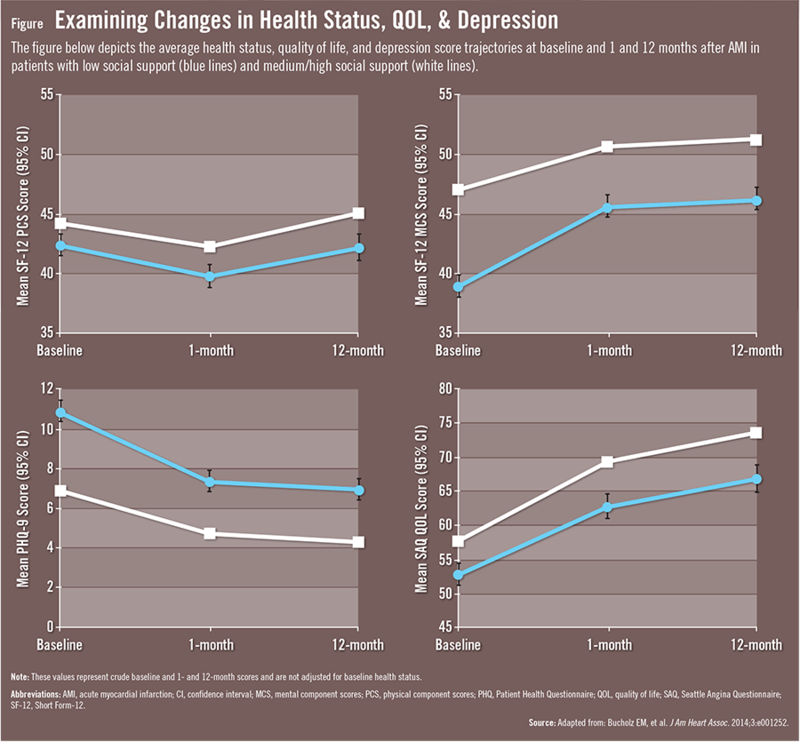 VIRGO contains detailed socio-demographic and psychosocial information as well as data on mental health, depression symptoms, and QOL during follow-up. Data from VIRGO were used to investigate both the physical and mental health consequences of low social support after AMI. The investigators evaluated self-reported social support from 3,432 AMI patients between the ages of 18 and 55. Participants were surveyed during the index hospitalization and at 1 and 12 months after their AMI and then categorized as having low, moderate, or high social support. According to the results, more than 21% of all patients in the study were classified as having low social support, with men and women having comparable social support levels at baseline. Collectively, results of the study suggest that young patients with low social support have poorer mental health and more depressive symptoms at the time of AMI. This may place these individuals at higher risk of poorer overall health outcomes during the year following their AMI. The mechanisms by which low social support negatively affects AMI patient outcomes remain unclear and require further investigation, and evaluations on potential interventions for reducing risks are needed. Given the low mortality rate in younger patients with AMI, clinicians may need to focus on outcomes such as health status, depression, and QOL when designing interventions for patients with low social support. Bucholz EM, Strait KM, Dreyer RP, et al. Effect of low perceived social support on health outcomes in young patients with acute myocardial infarction: results from the VIRGO (Variation in Recovery: Role of Gender on Outcomes of Young AMI Patients) study. J Am Heart Assoc. 2014;3:e001252. Available at: http://jaha.ahajournals.org/content/3/5/e001252.full. Bucholz EM, Rathore SS, Gosch K, et al. Effect of living alone on patient outcomes after hospitalization for acute myocardial infarction. Am J Cardiol. 2011;108:943-948. Lett HS, Blumenthal JA, Babyak MA, Strauman TJ, Robins C, Sherwood A. Social support and coronary heart disease: epidemiologic evidence and implications for treatment. Psychosom Med. 2005;67:869-878. Barth J, Schneider S, von Kanel R. Lack of social support in the etiology and the prognosis of coronary heart disease: a systematic review and metaanalysis. Psychosom Med. 2010;72:229-238. Mookadam F, Arthur HM. Social support and its relationship to morbidity and mortality after acute myocardial infarction: systematic overview. Arch Intern Med. 2004;164:1514-1518. Burg MM, Barefoot J, Berkman L, et al. Low perceived social support and post-myocardial infarction prognosis in the enhancing recovery in coronary heart disease clinical trial: the effects of treatment. Psychosom Med. 2005;67:879-888. Emily M. Bucholz, MD, PhD, MPH, has indicated to Physician’s Weekly that she has received an F30 training grant from the National Heart, Lung, and Blood Institute (F30HL120498-01A1).